We initially had an idea for creating a lending platform to allow individuals to borrow ETH using their NFT assets (such as valuable CryptoKitties) as collateral. However, we realized that the number of people who would be willing to lend against such an illiquid asset would be very low, as there is little guarantee that an individual non-fungible token will maintain the same demand or value tomorrow. Since NFTs as an asset class have been rapidly increasing in value, we hypothesised that we could hedge against the risk of individual NFTs falling out of demand by creating a diversified basket of NFTs belonging to established projects as well as up and coming ones. 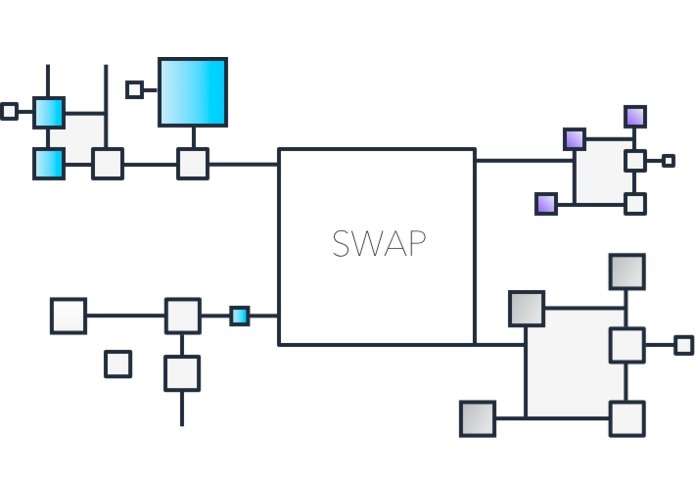 SwapDAO allows lenders to stake ETH in order to form the liquidity pool for a bond and vote on different market parameters such as accepted NFTs, collateral requirements, and the interest rate. Borrowers can then deposit their NFTs and borrow ETH, making monthly payments until the bond reaches maturity and all ETH is returned to the lenders and the NFTs are returned to the borrowers. Lenders receive an ERC-20 token, SDT that entitles them to their monthly payments and allows them to vote on governance issues regarding the bond. Borrowers receive an ERC-721 token, CKO, that entitles them to receive their collateral once the bond reaches maturity. If Borrowers successfully make all loan payments with zero delinquencies, their CKO will convert into SDR, a non-transferable ERC-721 token that they can stake in the future to participate in lower interest bonds that require Borrowers to have prior credit history. We created a smart contract on Ethereum that allows Lenders to pool their ETH and Borrowers to stake their ERC-721 non-fungible tokens. We built the frontend for our platform using React. The ERC-20 token for Lenders, SDT, is tradable on 0x in order to enable a secondary market in which credit obligations can be bought and sold, because we believe the ability to seamlessly trade risk is pivotal in an emerging market. Price discovery for ERC-721 tokens is much more difficult than price discovery for fungible assets such as ERC-20 tokens, as the amount of bids and asks for one specific asset such as a Gen 0 CryptoKitty is much small than the order book for a ubiquitous token such as Ethereum. Furthermore, there are very few exchanges that list ERC-721 Tokens and none of them to date have APIs that allow access orderbook data. We're glad that we were able to create a bridge between this new economy of digital value and the larger, more liquid cryptoeconomy. We're proud to provide the framework for the next generation of intelligently governed, digital asset backed securities. We learned how to deal with the challenges of an emerging market, like how to hedge against uncertainty arising from lack of price discovery and illiquidity, as well as how to create an open-ended framework that allows market participants to create better bonds over time as the NFT ecosystem grows and Lenders become more informed. Originator of the initial idea. I wrote the buyback ERC721 contract, product workflow, and wrote the technical portions of the white-paper. Founder of n.exchange - The planet's fastest way to convert cryptocurrency, for individuals and enterprises alike.